Cardi B & Beyonce are the only women to hold four positions in the Hot R&B/Hip Hop Songs Chart. It seems like a week can't go by without Cardi B winning. The Bronx femcee has reached some incredible feats in such a short period of time. The most interesting part about it all is that her success only really started in August and since then, she became one of the most sought out artists in the industry. Today, she reaches another massive feat in her career as "Bartier Cardi" moves it's way to the Top 10 on Billboard's Hot R&B/Hip Hop Songs Charts. Cardi B & Beyonce are officially tied as the only two women to have four songs in the top 10 on Billboard's Hot R&B/Hip Hop Songs Charts simultaneously, Billboard reports. 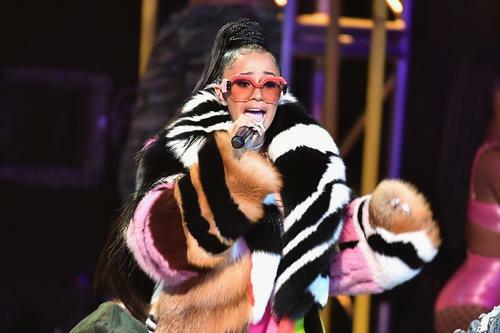 Cardi B's "Bodak Yellow" sits at number five while "Bartier Cardi" shifts from 7 to 9. Meanwhile Migos' "Motorsport" sits at number 3 while G-Eazy's "No Limit" maintains its number two position. The only other woman to do it is Beyonce who had four cuts off of Lemonade sit at the top 10 on the chart back in 2016. Beyonce's "Formation," "Sorry," "Hold Up," and "6 Inch" featuring The Weeknd were took over the top 10 on the week of May 14th, 2016. While Cardi B and Beyonce tie for the record, they join six other male artists to ever accomplish that. 50 Cent was the first to do it in 2005 and later on, Kendrick Lamar, Drake, Lil Wayne and 2 Chainz accomplished the same. However, Drake and Kendrick Lamar are the only two artists to have half of the entries on the top 10 Hot R&B/Hip Hop Songs Charts at once.